Pure Flix is all about "faith, family and fun" — and occasionally politics. But with “God’s Not Dead,” Pure Flix came alive. The pointed drama, released in early 2014, centers on an evangelical college student who stands up to his stridently atheistic professor. It grossed more than $60 million domestically — not exactly a runaway blockbuster, but a healthy profit for a project that cost a mere $2 million. It would become one of the top 10 highest-grossing Christian-themed movies of all time. Since then, Pure Flix, based in Scottsdale, Arizona, has evolved into a small-scale media empire, churning out Christ-centered movies (including two sequels to “God’s Not Dead”) and chipper sitcoms, as well as a home-schooling curriculum for families. It has risen to prominence as the American entertainment landscape has become increasingly fragmented, making it easier for upstart players to go after niche or underserved viewers. PureFlix.com, its on-demand streaming service, attracts more than 125,000 subscribers who pay $10.99 a month. It features around 10,000 pieces of exclusive and licensed videos, from Billy Graham sermons to an original drama series co-starring Antonio Sabato Jr., the model-turned-actor who spoke at the 2016 Republican National Convention. But real-world politics aren’t entirely absent from its business. In the controversial “Death of a Nation,” which opened nationwide on Friday, D’Souza argues that Trump is analogous to Abraham Lincoln and Democrats are akin to Nazis. “Death of a Nation,” however, is not the prototypical Pure Flix movie. The stock and trade of the company is still projects like last year’s “The Case for Christ,” an earnest drama about an atheist journalist who, seeking to disprove his wife’s religious belief, discovers that God isn’t fake news. Among the company’s strengths is producing content that affirms or validates the core beliefs of its average viewer, according to Paul Asay, author of the “Watching God” blog on Patheos.com, a religious issues website. In the eyes of many of its viewers, Pure Flix helps fill a void, providing a substantial group of Americans with what is marketed as a wholesome alternative to Hollywood and other mainstream media choices. “It’s hard to find high-quality movies that are Christian and faith-based,” said Ben Carson, the secretary of housing and urban development, who attended the red-carpet premiere of “Death of a Nation” in Washington on Wednesday night. But the Pure Flix fan base might need validation of its political beliefs, too. The three films in the “God’s Not Dead” trilogy, for example, tackle supposed anti-Christian fervor on American campuses, making the case for religious liberty in the face of academic secularism. Pure Flix is not marketed to political conservatives, per se, but its offerings have been well received among Republican luminaries. Sen. Ted Cruz, R-Texas, and Mike Huckabee, for example, each hosted screenings of “God’s Not Dead 2” during the GOP presidential primary in 2016. 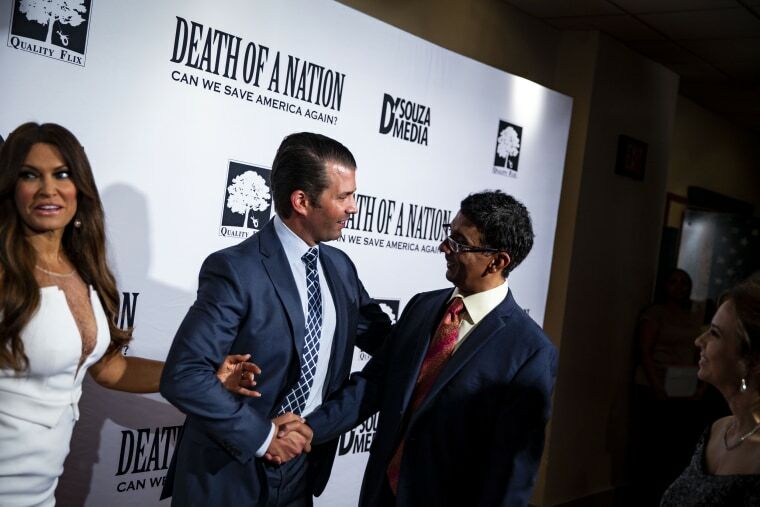 And the Washington premiere of “Death of a Nation” this week was hosted by Donald Trump Jr., who was joined in the basement level of the Landmark E Street Cinema by ex-White House aide Sebastian Gorka and former Milwaukee Sheriff David Clarke. Pure Flix is one of a handful of so-called faith-based production companies that have sprung up in recent years, a list that also includes Sony Pictures’ Affirm Films, the label behind the Kirk Cameron marital melodrama “Fireproof." DeVon Franklin, a former Columbia Pictures executive who was raised as a Seventh-day Adventist, is one of the rising stars on the faith-based circuit. He is producing next year’s “Breakthrough,” an adaptation of “The Impossible,” a Christian novel about the resurrection of a 14-year-old boy. Of course, many faith-based filmmakers and producers avoid hot-button social issues and ripped-from-the-headlines themes altogether. The vaguely spiritual made-for-TV movies on the Hallmark Channel, for example, generally stay away from topicality. And the inspiring family films that Dallas megachurch pastor T.D. Jakes has produced for Sony Pictures, similarly, shy away from contentious current events. “I think politics is a divisive conversation to have both within and outside the evangelical film market,” said Jakes, who co-produced “Miracles From Heaven,” starring Jennifer Garner, and “Heaven Is for Real,” starring Greg Kinnear. In contrast to Pure Flix’s movie studio, the digital division tries to reach “as many people we can can,” said Gudorf, who added that the customer base for the streaming service includes a mix of Protestant, Catholic, Jewish, Muslim and “even some Hindu and Buddhist” viewers.